Terra Cotta Pot 6"x5.5” (15x14 cms), 1-3 Peruvian Daffodil bulb, white paint, sea shells, tacky glue, scotch tape, soil & water. Place a piece of scotch tape over the drainage hole to prevent soil from coming out while planting. Paint pot white and let dry. 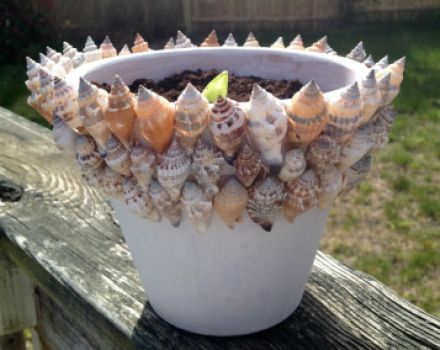 Adhere seashells with glue, around the rim and downwards. Create as many layers as you like. Use permanent adhesive glue to avoid damaging pot outdoors. Fill pot 1/3 rd full of soil. Add Peruvian Daffodil bulb (pointed end up), then cover with soil to the top. Water very sparingly (1/4 C.) until the pot is placed outside in a sunny location (don’t forget to remove the scotch tape from the bottom of the pot). Plant in spring. Blooms mid summer to late summer. Blooms in 10-12 weeks. Water throughout the flowering season.